"Would you … mind signing my book?" I’m pretty sure I looked behind me the first time somebody asked me that. It was at the FASA Corporation booth at GenCon, back when I was freelancing for Shadowrun and the Awakenings sourcebook (my first project with cover credit) was brand new. I figured they had to be talking to somebody else at the (relatively busy) booth but, no, it was me. Truth be told, I’m still almost as surprised and flattered these days when people ask me to sign books I’ve written as I was then, well over a decade ago. I wish I was better prepared for it. At best, I manage to scribble my name, and sometimes add a nice catch-phrase or something. To my credit, I do generally remember to keep a pen in my pocket at conventions and public events these days, so I don’t have to fumble and search for one like I used to when a signing request caught me completely off-guard. If you catch me without one, chances are you’re my first signing of the day. This all comes to mind because one of my tasks this week is a lot of signing: hundreds of commemorative bookplates for the 10th Anniversary Edition of Mutants & Masterminds, in fact. It’s one of the special features of the edition and, since Green Ronin is spread all across North America, the bookplates got shipped to my place in New Hampshire, where I’m in the process of signing them, then they’ll get shipped down to Production Manager Hal Mangold in Virginia so they can go out to the backers of the Kickstarter awaiting them. Even if you have a mortgage, you probably don’t have the experience of signing your name hundreds of times. I’ve been breaking the process up into smaller chunks: grabbing a handful of bookplates and signing them, then going back to work or whatever else I’m doing. I’m trying to avoid things like signing while eating meals (no getting food on the bookplates!) and, when my signature starts to look even more unintelligible than usual is when I take a break and give my signing hand a rest. I thought about getting all cute: signing every tenth or twentieth bookplate with some crazy thing (like characters from Freedom City or even some of my non-Green Ronin projects) or drawing little hearts and flowers, but I decided to stick with the straightforward signature folks were promised, in good ol’ black ink. Still, you never know, as I’m probably still working on it as you read this and, as time goes on, the temptation to go "off-script" grows…. Anyhow, I know this Roundtable seems to be a lot about me and how cool it is that people want me to sign things (and it’s really cool, don’t get me wrong) but the real reason why I’m telling you all this is to hopefully convey my gratitude and deep personal appreciation that so many people not only like my work enough to shell out money for it and therefore keep me from getting an honest job but—as if that weren’t enough—they are also kind enough to think that my signature adds value to their book rather than "Hey! Who’s that weirdo writing in my book!" 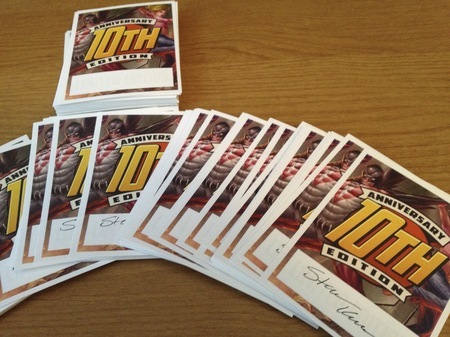 So I hope everyone who backed the 10th Anniversary Edition enjoys their signed bookplate (trust me, I really signed every one by hand) and, should you ever run into me at a convention, just note for future reference that the answer to "Would you mind signing my book?" is always "Of course not, it would be my pleasure."